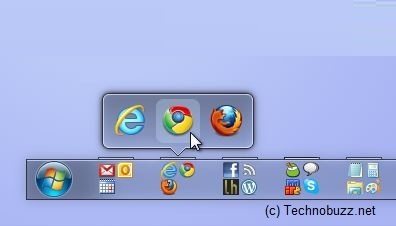 Bins is a windows app which helps you to Group Your Taskbar Icons in Windows 7 to reduce taskbar clutter. It’s based on the Mac OS X feature, which supports “stacking” of dock icons in a similar way. Its simple to use Create a Bin, create a bin by dragging one taskbar icon on top of another, and dropping into the popup that appears. Ungroup shortcuts by dragging the icon back to the taskbar. No need to open a settings screen; Bins is simple and intuitive. Once combined into a Bin, your shortcuts will appear instantly when you mouse over the group’s icon, for launching or for window-management. Move your mouse away and your Bin will tuck back into the taskbar. Never heard about this tool before, but it sounds very smart and easy to use. I wish that Microsoft would make more of that kind built-in to the OS.